Market shaping and procurement constitute a core approach to achieve Gavi’s mission to accelerate access to and increase equitable coverage of vaccines. Gavi drives lower prices and ensures the supply of high-quality vaccines through a range of tools such as pooling demand with assured funding, offering multi-year contracts, and encouraging new suppliers to enter the market, among others. Gavi has made notable progress, including securing a sustainable and affordable supply of pentavalent, pneumococcal conjugate (PCV), and rotavirus vaccines; expanding and diversifying the manufacturer base; and developing demand forecasts to give manufacturers longer-term market visibility. These efforts have no doubt provided benefits to Gavi-supported countries, and they have also had some positive spillovers in Gavi-ineligible countries. Yet several challenges—stemming in part from countries transitioning from Gavi support and an evolving vaccine manufacturer landscape—may impede Gavi’s ability to effectively deliver on its mission in the future. The next five-year strategy (Gavi 5.0) is an opportunity to evolve—and possibly broaden—Gavi’s role in market shaping and procurement. Looking ahead, Gavi will need to more carefully assess the implications of its market shaping strategies beyond Gavi-supported countries—and consider ways to potentially extend its benefits to the entire universe of low- and middle-income countries. And as more countries transition, a scaling back of Gavi’s role in directly financing and purchasing vaccines will merit a concurrent scaling up of efforts to strengthen the procurement enabling environment. Supporting countries today to access affordable, high-quality vaccines through targeted market shaping and enhanced procurement support will empower them to make existing budgets go further in the future, freeing up resources to expand coverage and introduce new vaccines. Market constraints at the global level hinder countries’ abilities to access a timely, stable, and affordable supply of high-quality vaccines to meet their needs. Procurement inefficiencies and supply breakdowns can lead to disruptions in immunization programs and can be an important driver of under-vaccination; they may also contribute to delayed or deferred introductions. Nevertheless, some Gavi-supported countries are introducing vaccines, even as data reveal a stagnation in coverage rates of basic vaccines and/or earlier-introduced new and underused vaccines at suboptimal levels. One hypothesis suggests that Gavi’s approach to demand consolidation may emphasize new introductions to achieve sufficient volumes across countries to access favorable prices, underscoring the need to carefully balance trade-offs across priorities. Further, constraints related to supply and competition for specific vaccines at the global level are putting increasing pressure on Gavi’s market shaping tools (see figure 1). In the case of the human papillomavirus vaccine (HPV), increased demand from countries, driven in part by Gavi’s own efforts to boost introduction, is outstripping production capacity. For the pentavalent vaccine (Penta), where prices have been pushed below $1 per dose, one manufacturer exited the market in 2017. While other manufacturers remain, this nevertheless illustrates the importance of balancing trade-offs between price and supply security. Last year, Merck pulled out of its agreement with Gavi and UNICEF to provide rotavirus vaccine (Rota) to four West African countries, potentially redirecting product to the more lucrative market in China, as some reports suggested. This case underscores certain risks of nonbinding agreements where there may be little or no recourse when manufacturers renege on commitments. Ultimately, it also highlights the need to better understand the implications of Gavi’s market shaping strategies on the broader market landscape. Source: Authors, based on the 2015 Healthy Markets Framework developed by Gavi, UNICEF, BMGF, available here. High vaccine prices pose a critical problem in many middle-income countries—and notably among the cohort of never-Gavi eligible countries. 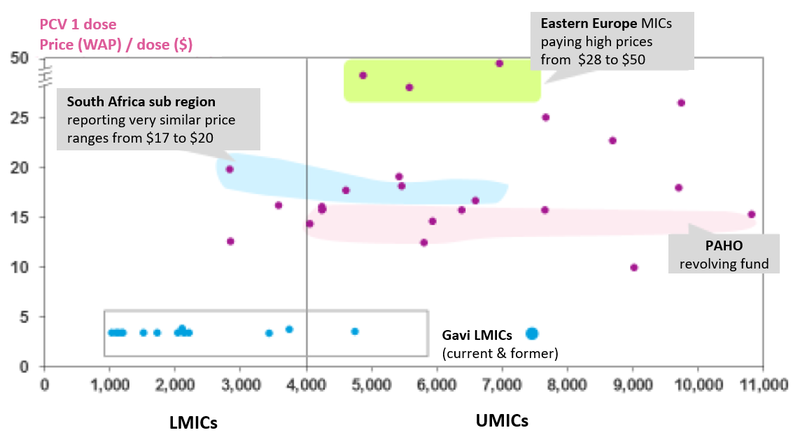 Figure 2 illustrates significant variation in prices paid across lower-middle and upper-middle income countries for a single dose of PCV. In comparison to the multi-year supply agreement price of $3.03 to $3.30 per dose available to Gavi countries, non-Gavi middle-income countries in Southern Africa pay $17 to $20 for a single dose, while those in Eastern Europe pay as much as $28 to $50. While the underlying cause of price dispersion is not immediately obvious, it may suggest a tiered pricing strategy by suppliers. In theory, tiered pricing can help improve access, however in practice, higher prices have proven to be locally cost-ineffective in some middle-income country contexts (e.g., Thailand). High prices are an important driver of underperformance on vaccine coverage, and may also deter new introductions. For example, never-Gavi countries lag behind current and former Gavi countries on PCV introduction. This may be because PCV is locally cost-ineffective at current market prices, though it would be cost-effective at the Gavi price; it may also be an issue of limited fiscal space. Source: Gavi Report to the Board, Annex B: Supplementary contextual analysis, available here. Data represent 2016 prices reported to the V3P database (country names are anonymized). Source: Authors based on 2016 price data for PCV reported to the V3P database (country names are anonymized). This reality may be indicative of future problems for Gavi graduates. Transitioned countries can access multi-year supply agreement prices through manufacturer commitments via UNICEF or PAHO (Gavi’s designated procurement agents). This support helps smooth the transition process. However, it applies to select vaccines, is time limited with varying lengths, and has many exceptions, and the nonbinding nature of commitments can create uncertainty. Moreover, the unpredictability of vaccine prices offered in response to national tenders affects budgeting and planning for self-financing countries. For example, India’s recent domestic inactivated polio vaccine (IPV) tender saw an unexpected 80 percent price increase, prompting the government to request 50 percent cost-sharing support from Gavi of $40 million over 2019–2021. This is a unique case, but it may illustrate the nature of challenges to come. Several large middle-income countries that are top recipients of Gavi support—notably Nigeria, India, Pakistan, and Bangladesh—are projected to be fully self-financing by 2030. Accordingly, Gavi’s leverage in negotiating lower prices through pooling demand alone may become constrained. This could exacerbate pricing challenges, as manufacturers may, for example, face greater unpredictably related to payments and tendering; in some cases, they could raise prices to account for higher transaction costs to serve more fragmented markets. The sustainability of Gavi’s approach to transition will ultimately hinge on countries being able to manage the procurement process and related functions themselves. Yet numerous impediments to successful procurement remain. Key barriers, as identified by CGD’s Working Group on the Future of Global Health Procurement and other studies, include weak capabilities, institutions, and processes to assume self-procurement, as well as weak regulatory capacity, most notably in transitioning countries. Furthermore, Gavi-supported technical assistance, delivered by Gavi partners, appears more geared toward vaccine delivery. While downstream supply chain issues certainly pose a critical barrier to effective and equitable coverage, procurement processes further upstream merit greater attention. Gavi should continue to broaden the scope of its market analyses to better understand the (positive and negative) implications of its market shaping strategies on non-Gavi markets, with priority to limited competition vaccine markets. Similarly, Gavi should also continue to prioritize a wide range of market shaping tools to attract new suppliers to market and drive innovation, including advance purchase commitments and volume guarantees, where applicable. One possibility could be an AMC/APC-type mechanism for an IPV-containing hexavalent vaccine, though attention should be paid to creating the kinds of incentives that would enable adequate and growing future supply while still assuring viable markets for pentavalent and standalone IPV while hexavalent is gaining acceptance and adoption. At the same time, Gavi should invest in strategically expanding the menu of procurement modalities, in collaboration with partners such as UNICEF. As one example, Gavi could systematically pilot, evaluate, and adopt auction-like tools in vaccine markets with adequate supply and competition. (Currently, only the Penta market has adequate supply and competition but Gavi and partners could look to apply auction designs to other vaccine markets that meet this description in the future.) 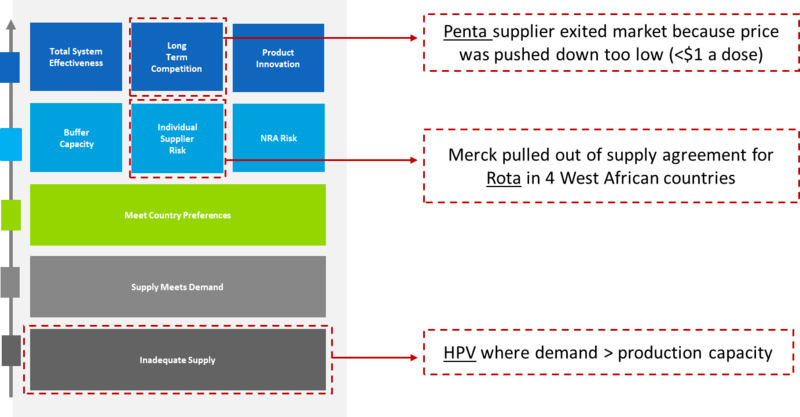 A range of design instruments could help achieve supply security and lower prices—such as a phased approach where portions of total forecasted quantities are awarded in multiple rounds (as was the case with the 2016 pentavalent tender) or allocation of quantities across multiple suppliers. Finally, Gavi could expand demand forecasts to include self-financing and/or self-procuring middle-income countries in select vaccine markets where demand predictability may be an issue. This could be built into the existing Vaccine Product, Price, and Procurement (V3P) platform, managed by WHO, which aggregates vaccine purchase data for some 150 countries. This may also be relevant within the framework of an Innovation Partnership with one or more middle-income countries to drive vaccine research and development. Where specific vaccines exceed local cost-effectiveness thresholds, Gavi could consider providing a modest subsidy to fill the gap between the vaccine price and the level at which it becomes locally cost-effective. This modality would be relevant to self-financing transitioned countries—and in certain never-Gavi countries—for specific high-priority vaccines. It would help ensure adequate volumes to be sustained to enable further market shaping work that relies on aggregated volumes to achieve sustainable pricing. For limited competition vaccines, Gavi could also enable buy-ins from noneligible countries and secure appropriate tiered pricing tied to local affordability and cost-effectiveness through globally negotiated agreements. This could potentially help address constraints to vaccine introductions in some Gavi-ineligible countries where market prices exceed local cost-effectiveness thresholds. In collaboration with UNICEF, Gavi could expand the Vaccine Independence Initiative (VII) to make bridge funding available to a greater number of self-financing countries that face liquidity constraints to pre-payment. The VII—whose scope was expanded to all essential commodities in 2015—has a current capital base of $100 million; pre-financing requests are expected to reach an estimated US$225 million by 2020. In a similar vein, Gavi could work with partners and manufacturers to achieve greater predictability in pricing agreements available to transitioning and transitioned countries to facilitate more accurate, reliable budgeting and planning. Incorporating a standardized assessment of procurement bottlenecks and performance indicators (see below) into multi-partner Transition Assessments, as Gavi and partners are working to do, would help ensure barriers are sufficiently addressed during the transition planning processes. Where applicable, Gavi should continue to prioritize greater investments in targeted assistance for procurement and procurement-related functions (e.g., product selection, regulatory capacity, etc.) through existing modalities, including Gavi Transition Plans and Post-Transition Engagement. A more deliberate focus on building capacity over the long-term is a necessary complement to short-term support. This support could include trainings to boost demand for and use of data and market information currently available through the V3P/MI4A project to improve decision-making. Gavi’s targeted support in this area could consider a results-orientation, linking financing to the achievement of measurable outcomes. In collaboration with partners, Gavi should also consider extending technical assistance for priority-setting around adoption/introduction, product selection, and procurement processes to never-Gavi countries that are lagging in these capacities. support for expedited drug registration processes at country-level to lower transactions costs and barriers to entry. See the accompanying note in this series, “Gavi’s Approach to Health Systems Strengthening (HSS): Reforms for Enhanced Effectiveness and Relevance in the 2021-2025 Strategy,” which focuses on delivery platforms to ensure those vaccines reach their target populations—another key pillar of Gavi’s vaccine support. We acknowledge that the current structure of agreements can have benefits and drawbacks. In some instances, nonbinding agreements can be of good service to stewardship of donor funds, by not requiring Gavi to procure doses it may not need if there is a delay in country readiness pushing out a vaccine introduction date, for example. UNICEF’s Vaccine Independence Initiative (VII), discussed later in this note, helps address this issue. Note that a country may choose to use an external procurement agent such as UNICEF or PAHO for certain vaccines but opt to self-procure others. (Arias, Daniel, Cheryl Cashin, Danielle Bloom, Helen Saxenian, and Paul Wilson. “Immunization Financing: A Resource Guide for Advocates, Policymakers, and Program Managers.” Washington, DC: Results for Development. 2017. Cernuschi, Tania, Stephanie Gaglione, and Fiammetta Bozzanic. “Challenges to sustainable immunization systems in Gavi transitioning countries.” Vaccine, vol 36, issue 45 (2018): 6858-6866. https://doi.org/10.1016/j.vaccine.2018.06.012; Kallenberg et al 2016; Saxenian et al 2015. “The Expansion of the Vaccine Independence Initiative (VII): Protecting Children with Life-Saving Supplies.” UNICEF Financial Innovation Lab, n.d. https://www.unicef.org/supply/files/INNOVATION_LAB_LFLT_Ver1_Single_Pages.pdf; Arias et al 2017.